Shark Tank Is Casting In Detroit! Detroit’s automotive history may have earned it the nickname Motor City, but the city is also renowned for a strong sports engine, fueled by a championship legacy of professional teams and local youth clubs, that never stops running. The May 26 opening of the Nike Detroit Community Store aims to both power and accelerate this legacy. Nestled in downtown’s historic F.W. Woolworth Co. building, at 1261 Woodward Avenue, the space was once home to the eponymous pioneer of the five-and-dime stores, which converted the complex into a significant shopping destination at the turn of the century. More than 100 years later, Detroit is focused on reinvigorating the area by reanimating vacant buildings as businesses and residences, introducing a light rail that connects the neighborhood to the bustling midtown and developing a shopping and entertainment complex across the street from the Detroit Community Store. Plus, a world-class hockey arena will soon open just a few paces away. “Sport is a cornerstone of our state pride," explains Tom Izzo, Michigan State University head coach and Basketball Hall of Famer. "Fostering early, positive experiences with physical activity is incredibly important for young adults, which is why I’m thrilled to welcome Nike to the city of Detroit." 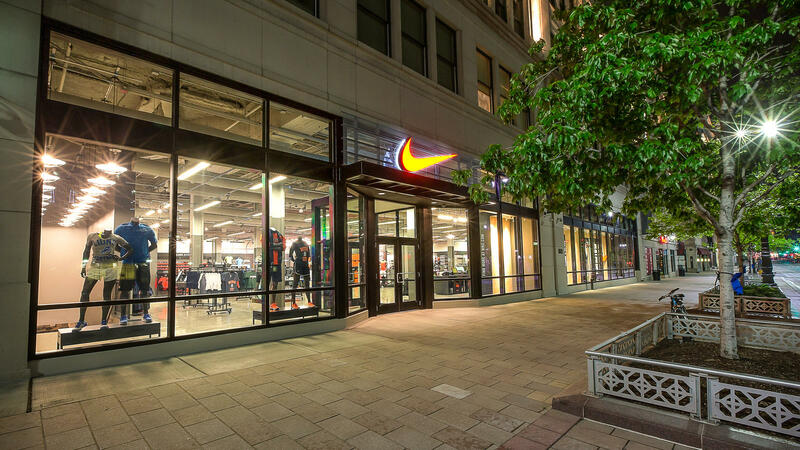 As with other Nike Community Stores, the new space operates with four key goals in mind. The first is the aim to hire at least 80 percent of its team from within a five-mile radius of the location. In some locations, like at the Nike East Los Community Store in Los Angeles, this number is virtually 100 percent. The second goal is to capture the spirit of the city with the store’s curated local design and product offerings. In the Detroit store, the walls feature photography of local sport courts and landmarks, including the Decquindre Cut Greenway, and "Detroit Never Stops" artwork by local typographer Neil Tasker. The store also carries Detroit-specific tee's and sports team apparel from the Detroit Lions, the Detroit Tigers and Michigan State University for men, women and kids. Thirdly, the store distinguishes itself by ensuring that its retail associates, known as “store athletes,” have an opportunity to give back to the surrounding community. In addition to the hours dedicated to community by all stores as part of the Nike Community Ambassador Program, Community Store athletes are allocated additional volunteer hours to support groups in their backyard. In fact, even before the store opened, the Detroit team was focused on engaging its community by volunteering with the local Boys & Girls Club chapter: the Diehl Club. Store athletes have been supporting the organization’s sport, recreation and fitness programming, including the chapter’s flag football program, as coaches and rec leaders, with plans to expand its community involvement further following the store opening. Finally, beyond its on-ground community activation, the Detroit Community Store is the first Nike Community Store to offer $40,000 in annual grants of $5,000 each to eight local non-profit groups via the expanded Nike Community Impact Fund, which also includes Nike Community Stores in Portland, Ore., South Chicago, New Orleans, the Ivy City neighborhood of Washington D.C., Brooklyn and the East Los Community Store in East Los Angeles. In total, Community Store teams across the U.S. will award $290,000 each year in their communities in partnership with CAF America and the Oregon Community Foundation. "By expanding Nike's Community Store concept to include local grant programs, we look forward to fostering even deeper connections that empower young leaders where our store teams live and work," said Dennis van Oossanen, VP and GM of North America Direct-to-Consumer.